This factory was the starting point for my father and it is also our point of origin. Although municipal consolidation has meant that the Kayou town that was the start point no longer exists, we used its name in the company name in order to preserve something of it. Our desire to utilize the characteristics of the region also drives our BCP activities. We believe that the role of Kayou Giken is to work for the growth and development of the area. In comparison with plastic, the benefit of metal is its strength. It is possible to make five fingers, incorporate human body sensors and use this for prosthetics or surgery. We believe that this kind of manufacturing that makes use of the strength of metal is one area where we can exhibit the advantages of press companies. 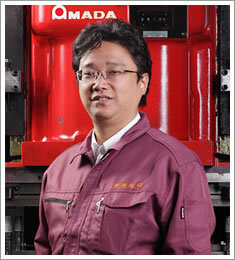 Our main products are currently automobile components. In the future, we hope to use press technology to also move into robot business. It is necessary for a company to create an environment where each and every employee can show independence and feel the worth of their work. To achieve this, we feel that interaction with the customers is very important. Our production staff provide direct support when a product is delivered and we believe that being able to feel the reactions of the customers helps the employees to develop and grow. We have all employees interact with the workplaces regardless of their age and gender. We believe that this leads to the birth of the new ideas that the workplaces require and that new inspiration is cultivated by utilizing those ideas. As a manufacturing company, we aim to provide reassurance and happiness for our customers and to be a company that customers can call on as “a company to rely on” any time they are unsure or experiencing trouble. 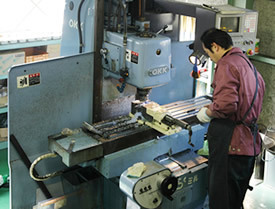 Kayou Giken prioritizes a relationship of mutual trust with customers and strives for reliable quality and a stable supply in order to always ensure customer satisfaction. Kayou Giken aims to create a working environment where the employees can use communication and independence to support each other, improve their knowledge and skills and past these on to the next generation. We will help people to feel happiness, both when the products we are involved in are delivered to society, and by maintaining and developing our company so that we can raise profits and pay taxes. 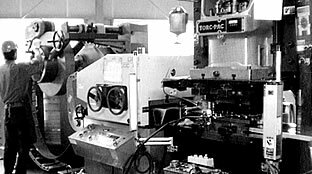 The company was founded in 1973 and has worked to cut, bend and make holes in hard metals for the more than forty years since. 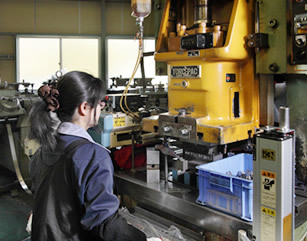 We have performed metal stamping and press mold fabrication on items ranging from small pieces measuring less than one centimeter up to large items measuring around 30 centimeters. We also took a great step forward in October 16th, 2006 with the acquisition of ISO 9001 certification. 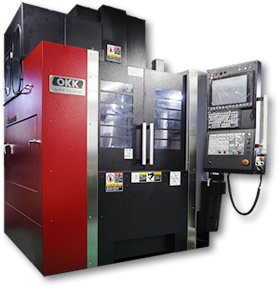 This acquisition of ISO certification not only greatly improved the quality level of Kayou Giken pressed parts, it also earned us great trust. 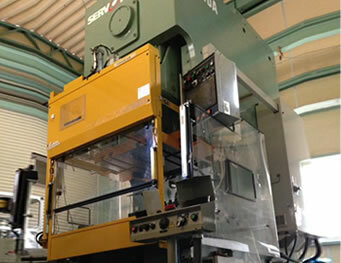 Our trading partners increased in number and we also started to receive requests for just molds. 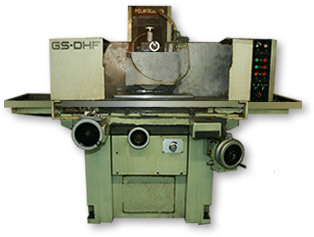 This is press machinery that is driven by servo motors so that the speed, position and pressure during processing can be set freely with numerical settings. 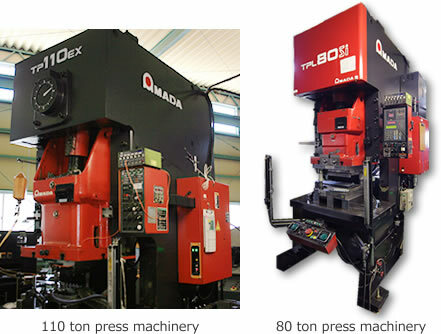 Press machinery to complete one process with one mold. The work is performed by human hand. A structure that cuts with the same principle as when cutting paper with scissors. 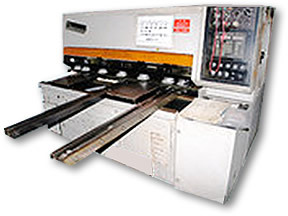 The sheet metal materials are inserted between upper and lower blades and then pressure is applied on the upper blade for the cutting. 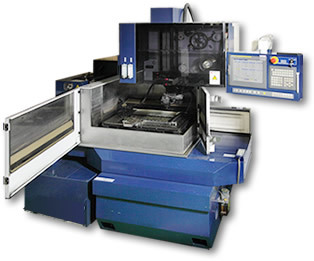 The structure makes it possible to install multiple different tools simultaneously, so it is possible to manufacture a large volume of parts in a short period of time and products can be supplied to customers with short delivery periods and low prices. Copyright(c) 株式会社 賀陽技研.All Rights Reserved.